Hello everyone! 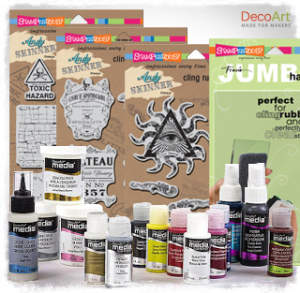 Welcome to the big Stampendous and DecoArt blog hop finale! Throughout this week both design teams have been very busy tempting you with delicious designs and inspiring projects to get your creative juices flowing. This collaboration has always been one of my absolute faves as I absolutely loooove playing with stamps and paints! I hope you will enjoy visiting the other posts published earlier this week, if you haven't seen them yet. The week has been packed full with fantastic projects - you really don't want to miss seeing any of them! So what has this week really been about? The whole Stampendous gang along with our friends at DecoArt have joined forces to show off some fantastic stamps designed for Stampendous by Andy Skinner who's a great mixed media artist and DecoArt International Education Coordinator. Andy will join us along with his team of international mixed media artists including Julia Stratford-Wright, Mark Gould, Mel Hookham and Jools Robertson. 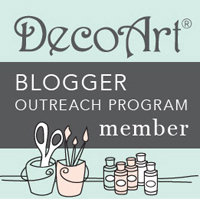 Plus there will be posts this week on the Stampendous and DecoArt blogs as well. And let me tell you. You’ll want to get your commenting fingers ready… Each comment on a post this week will enter you to win a fabulous prize package! (one comment per post, per person). Contest open to everyone! 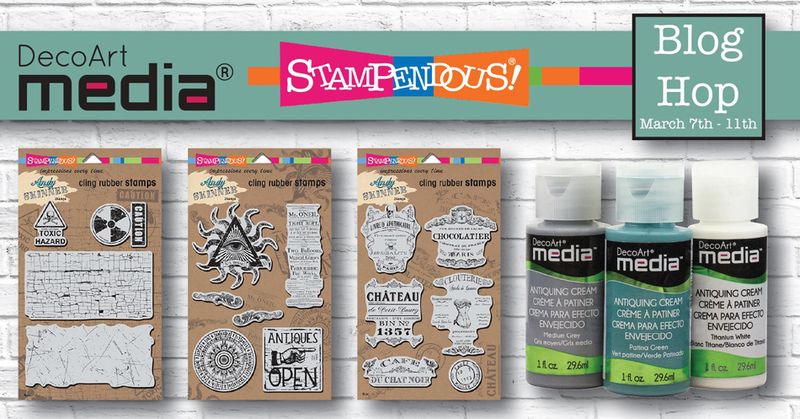 We have three packages and each has a Fluid Media Starter Kit, all three of Andy Skinner’s new Stampendous Stamp sets and a Jumbo Acrylic Handle. Look at this great prize! I have a super sweet project for you today! I altered an ordinary, boring, metal CD tin and created this choccie tin instead! Needless to say, the chocolates are long gone - just say'n, in case you wonder...lol. 1. 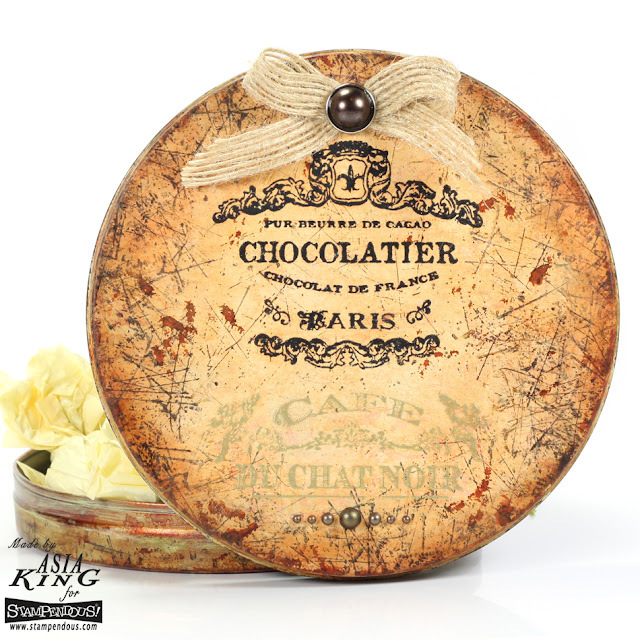 Using felt alcohol ink applicator cover the tin with Creme Brulee alcohol ink all around the edge. 2. Cover the top of the lid with Pearl White alcohol ink. 3. Using a cosmetic sponge dab Titan Buff paint all over the tin. 4. Add more Creme Brulee in places for more rusty look. 5. Stamp the 'scratches' with a texture stamp from the Toxic set using Spiced Chai and Ganache inks. 6. Add a wash of Quinacridone Gold paint, wiping some off with a baby wipe. 7. Stamp the labels from the Shabby Chic set and heat emboss in black and gold. 8. Finish off with a small bow and accent pearls. Holy moly! I'd never have guessed this was a CD tin! What a beauty you turned it into! Boring to beautiful. Definitely needs more chocolate since it got emptied. Oh my...nice work and a really good idea. Vintage Lusciousness. Great use of the stamps on this LOVELY box project. j. This is absolutely stunning!!! I think I just might have to get the supplies to make a few of these to put my Christmas candies in!!! Thanks for the inspiration! This is absolutely stunning and very beautiful!!! We make chocolates so this would be perfect!!! What a great idea! Thanks so much! That looks like a real vintage tin! You did such a wonderful job making it look old. I'd definitely put it in my collection. Beautiful patina, beautiful finish. 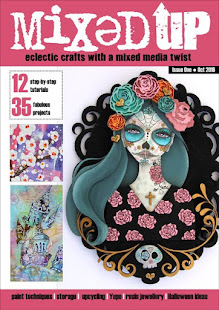 This is my favourite creation of the blog hop, whole week ! 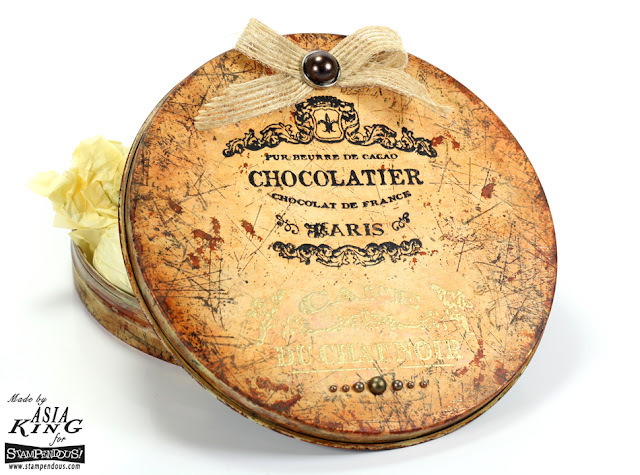 I'm sure chocolatiers would love to sell their chocolates in a box like this ! And it would sell !!! Oooh, that's a super gorgeous project!!! I love altering metal boxes, and using a mixture of alcohol inks and paints look great!!! Fabulous colours and the stamps are so nice. Thank you for the inspiration! Wishing you a good week-end. Gorgeous Work! 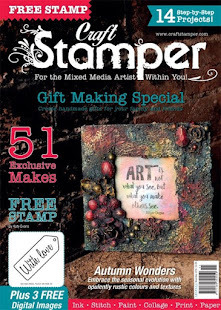 Then again what better combination than chocolate and rubber stamps, LOL. 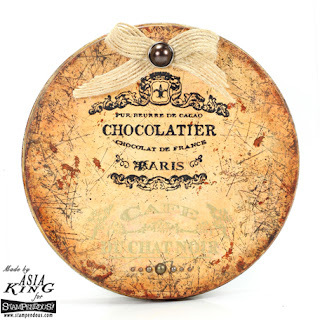 gorgeous vintage looking tin !! love this !! I must say this one is my favorite!!! I wouldn't even notice I got chocolates if I received this gorgeous box!!! Thanks for sharing!!! Your plain ole' box has been turned into a beautiful creation. I love what you did with it and would store beautiful embellishments and keep it sitting out for my inspiration. It looks very authentic. You'd never guess it had CD's in it once! What a lovely project Asia. Thanks for sharing with us your technique for making it. So sweet tin! What a nice gift! I like the crackle effect! This so well done and lovelyg. Love it. 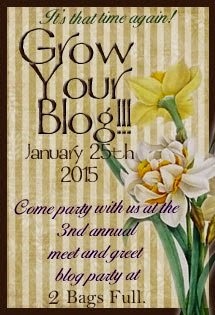 This has been a lovely bloghop, so many great tips trix and tutorials. Beautiful tin. Love your idea. I just love the antique look of this tin! The crackle stamp is a must have! Another amazing project! Just divine! Yummy! So chocolicious! Ok, that's not a real word, but it describes your fabulous tin to perfection. Now...off to find my chocolate stash! TFS! Absolutely fabulous project! Thank you for sharing it. It worked so well on the tin. look great with that stamp. I adore this tin Asia! It looks so very vintage! You did a fabulous job! Wow! A very cool project! Love it! Bookmarked this one as I have lots of tins that need a makeover and yours is a wonderful example of what I want mine to be. I would never have guessed that to be a tin, this could easily pass as vintage, I have quite a collection of tins I could do this with, love all things vintage. This is fabulous! I never thought about decorating tins in this way. Thanks for the inspiration! Wow, you are so talented, this looks like some kind of treasure I'd find in an expensive chocolate shop in Paris!